Erick Hawkins' choreography was influenced by his travels where he witnessed dancing ceremonies of Native Americans. Need help with a research paper? What follows is an example of a research paper topic on Erick Hawkins that our writers have created. Although each of these contributed greatly to the development, beauty, and creativity of modern dance, none aspired to the level of heights as Erick Hawkins in terms of imaginative and innovative production techniques. 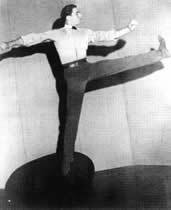 Hawkins is hailed as a "true dance radical" and a true pioneer of modern dance due to his development of new techniques and his original choreography. During his lifetime, Hawkins was motivated by a number of individuals and events that inspired him both personally and professionally. To fully understand how his unique technique developed and blossomed, a review of his life and those who touched him in ways that inspired his creative genius is given below. Erick Hawkins was born in Trinidad, Colorado, in 1909. Although his family moved to Missouri during his childhood, they returned to the Colorado Mountains often for vacation, the source perhaps, of Hawkins visual and artistic references to the natural world. He received a scholarship to study at Harvard while in high school. At Harvard, Hawkins majored in the classics. During his senior year, he attended a performance in New York City where Harald Kreuzberz was performing. Hawkins was so moved by this performance that he participated in a dance workshop with Kreuzberg in Austria after finishing his studies at Harvard. After the workshop was complete, he moved to New York where he continued his formal dance training. Gus Giordano - Throughout this century, well-known dance artists such as Fred Astaire and choreographer Bob Fosse have demonstrated their own style of jazz dance. The Diary of Nijinsky - His relatively brief but nonetheless illustrious career as a ballet star and choreographer had begun. Javanese and Balinese Dance - Not all Javanese dances may be performed by both male and female dancers. Kabuki is Japan's over-the-top dance experience. Aaron Copland - Copland also began composing music for ballet, including the successful Billy the Kid. A sample Erick Hawkins research paper looks at Hawkins as a 'true dance radical', and takes a glimpse at his style.